Very Good. 0385494785 ALL BOOKS SHIPPED WITHIN 1 DAY OF PURCHASE! What an eye opener!! Great book...about the awesomeness of Everest and the size of human ego. Even if you already know the story of the deadly Mt. Everest expeditions of 1996, you will appreciate Jon Krakauer's own first person account of the Adventure Consultants and the Mountain Madness groups. Both of these expeditions were led by well-seasoned Everest climbers---Rob Hall from New Zealand and Scott Fischer from the States--and had the aid of expert guides, Sherpas from Nepal and "outsiders". But we soon find that even these experienced people are not immune from the human frailties of greed, denial and self-serving. Those Achilles' heels will cause both expeditions to completely fall apart. At the same time, human error combined with the unforgiving terrors of high altitude climbing sets the scene for heroism in many of the climbers and crew. Krakauer, a journalist who signed on with Hall's expedition to do a story for Outside magazine, doesn't disappoint as weaver of a tale. I took the book everywhere with me while reading it, always eager to find out what would happen next. 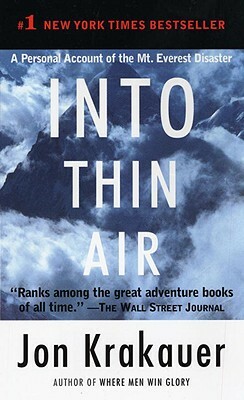 If a book that explores deftly our desire to reach an unreachable summit appeals to you....especially when that book does not shy away from the tragedy caused when the desire to reach it undoes common sense and humanity....I highly recommend "Into Thin Air." If you are an adventurer, this book is excellent. Saw the movie to follow reading the book. It paled in comparison to the writing of Krakauer. He is an excellent journalist and writer. His delivery makes you feel almost as if you were on the journey and it is a bit difficult to put down. Loaded with excellent information and facts of Mt. Everest and the lives of the sherpas. Excellent read.